Through the first two weeks of the season, there have been several surprises in the National Hockey League. But considering how poorly they were expected to do, the impressive start of the Calgary Flames has probably got to be the biggest shocker thus far. Putting up a 3-0-2 record with points in every game thus far, the Flames have quietly been putting together a strong start of their campaign. Here’s a brief look at how exactly the biggest underdogs in the league have done it. 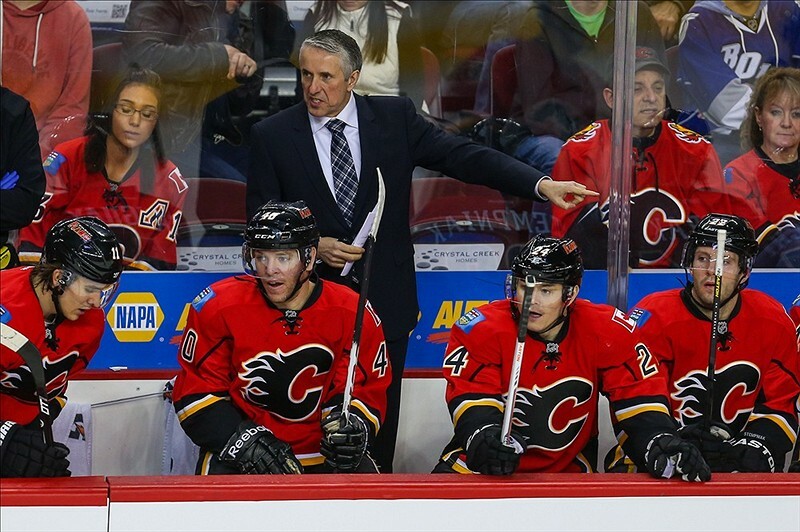 We’re now into Year Two of Bob Hartley’s reign as Flames coach, but because of the lockout trimming down last season’s camps, this might as well be considered his debut. Through a commitment to team fitness and a very structured system, the Flames have managed to stand toe-to-toe with many of the NHL’s best teams. The team structures itself rather similarly to a power-play in the offensive zone or a penalty kill in the defensive zone, along with an attention to fore-checking and back-checking to create turn-overs in-between. After his team’s 3-2 win over the New Jersey Devils, Flames captain Mark Giordano explained that the systems aren’t really “new,” but the fact that the club had a lengthy training camp to fully explain and implement these structures is one of the factors towards their success thus far. With the departures of Jarome Iginla, Alex Tanguay, Jay Bouwmeester and Miikka Kiprusoff – along with the injury to Mike Cammalleri – the Flames don’t have a lot of star-power. In fact, their line-up is full of names that most hockey fans across the league haven’t really heard of. 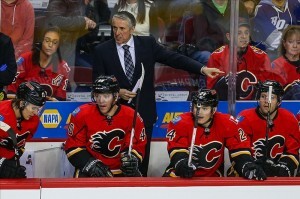 For the Flames coaching staff, this has proven to be a blessing in disguise. Calgary’s “first line” used to be whichever line Jarome Iginla was on, so opposition coaches merely placed their best defensive pairing up against that line and they had a decent shot at winning. While the fourth line is dedicated primarily to checking, each of the three other lines features some speed, some youth and guys that aren’t established as high-end NHL scorers. The names may be underwhelming, but which line do you throw your shut-down pairing up against? As an aside, this approach has also allowed some former complementary players like Bouma or Street to energetically throw themselves at the opportunity to create some offense. Outside of maybe the second period against the Devils, arguably the biggest key for the Flames has been their work ethic. Systems work if you use them, and line-up balance works if everyone is playing hard, and so far both of those things have been true. There haven’t been many players who’ve had “off-games,” or games where the team has had major lapses in coverage. Heck, the Flames lost twice – against Washington and Vancouver – and in both games the club staked themselves to leads earlier in the game due to merely out-working the other teams. They ended up losing, sure, but they were beating teams that are considered better than the Flames, and they managed to keep the game tied for 60 minutes so they walked away with something for their efforts. A 19-year-old product of the Ontario Hockey League, Calgary’s 2013 first round pick Sean Monahan has become a key component of the Flames’ early-season success. Playing on a line with fellow rookie Sven Baertschi (Calgary’s 2011 first rounder) and either Lee Stempniak or Jiri Hudler, the line has produced six of the team’s goals. That amounts to one-third of Calgary’s total offense. Monahan has been in on all six of these goals, scoring four of them himself and getting primary assists on the other two goals. When Monahan was kept up on the NHL roster, likely the intention was to give him a look to gauge his progress towards the NHL. Five games in, he’s showing himself to be a fully capable NHL body and he’s been referred to by teammates as a huge component of their early season success. He’s making it harder and harder for Flames management to consider sending him back to junior. The old saying goes, “You’ve got to be good to be lucky.” While the Flames have been good, they’ve also been lucky. Approximately 11.3% of shots taken by the Flames have gone in, which is one of the better rates in the league thus far. On the flip side, the team has been notably a recipient of less-than-amazing goaltending. While Karri Ramo and Joey MacDonald have been perfectly adequate in a general sense thus far, they have only stopped 89.7% of shots on goal. Calgary’s PDO, a measure combining shooting and save percentage, is 101, placing them 11th in the league. A PDO of 100 is considered to be statistically average (and is generally what all teams trend towards in the long term as “luck” is neutralized). In close games (when the game is tied or they’re leading or trailing by one goal), though, the Flames get quite lucky. In close games, the team has been the recipient of strong play. Their shooting percentage is 10.7% (5th overall) and their save percentage is 93.8% (5th overall), indicating that when the games have been on the line, the team has gotten the bounces into the net and kept the bounces out of the net. Their close game PDO is 104.5, indicating that their percentages are a fair bit above average. As for the rest of it, the Flames’ ability to out-work the opposition is almost entirely dependent on two factors: will and health. It’s a long season and while Flames coach Bob Hartley has motivated his group into consistent play and a strong start, it’s entirely up to the players to continue to put the work in. There’s still a lot of hockey left to be played, but the early success has likely bolstered the players’ resolve to dig their heels in and work. The injury factor cuts both ways. The team is already missing David Jones, Mike Cammalleri and Matt Stajan. When those guys return, the Flames will have some top-nine depth. On the other hand, while none of the injuries the Flames have suffered is really a product of their system, it’s probable that some bodies will start breaking down as the season wears on and the club keeps blocking shots. At that point, how far the team will go may be reliant on their ability to bring in quality call-up players from the AHL and bring them up to speed in a hurry.